E. Asian Develop'l State Model: So. 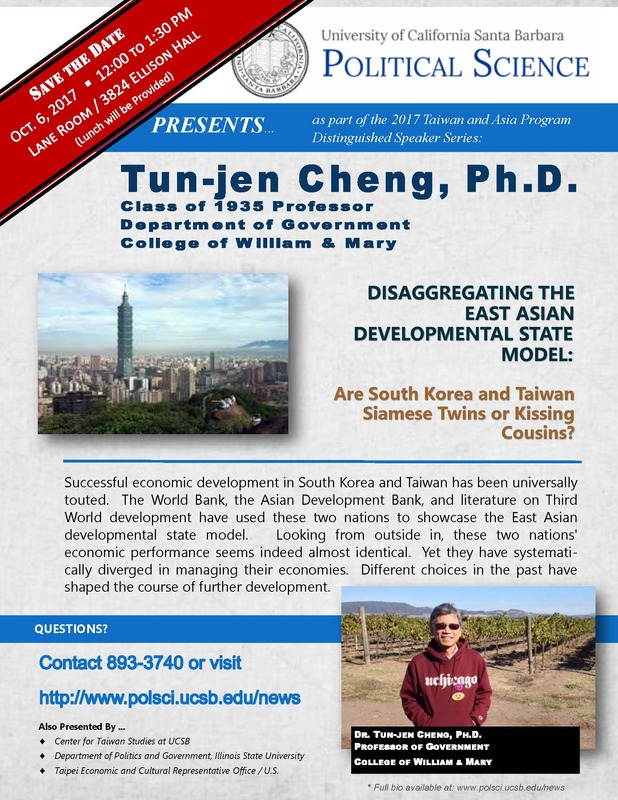 Korea & Taiwan - Siamese Twins or Kissing Cousins? Dr. Tun-jen Cheng received his B.A. from National Taiwan University, M.A. from University of Waterloo, Ph.D. from University of California, Berkeley and is Class of 1935 Professor in the Department of Government at the College of William & Mary. He has written extensively on political and economic change in East Asia. His latest publications are Routledge Handbook of East Asian Democratization (2017) and Public Opinion, National Security, and Regime Asymmetry (2017). Dr. Cheng served as editor-in-chief of the American Asian Review, is the founding editor of Taiwan Journal of Democracy, and is on the editorial board of a number of social science journals on China and Asian studies. His current research projects include: China’s Monetary Policy Making, China’s International Relations Scholarly Community, and the Trans-Pacific Trade Partnership. Successful economic development in South Korea and Taiwan has been universally touted. The World Bank, the Asian Development Bank, and literature on Third World development have used these two nations to showcase the East Asian developmental state model. Looking from outside in, these two nations' economic performance seems indeed almost identical. Yet they have systematically diverged in managing their economies. Different choices in the past have shaped the course of further development. Please join us and bring an interested colleague!